First, a shameless plug: Registration for my 2018 Teaching Trainings is live! If you want to move your practice and teaching forward, this training is the place to do it! Transitions in yoga—and life—can be choppy, unstable, and erratic. Below, you’ll find five essential concepts that make all transitions in yoga more smooth and skillful. You’ll also find three yoga transitions to incorporate into your practice and teaching in order to refine your mindfulness in the space between your postures. Slowing the movement between postures will helps you tune into the subtleties involved. In particular, you’ll observe which muscles have to engage in order to maintain your balance as you make your transitions. I encourage you to take an extra 2 or 3 breaths in your transitions on occasion—especially in the more accessible transitions like in between standing postures. Focusing on transitions may change the pace of your class, which might feel challenging for students who are accustomed to a faster pace. A skillful way to get students on board is to make it the theme of your class on occasion. Let your students know that transitions will be your theme and you’d like them to pay particular attention to the space between postures. The key to making a skillful yoga transition is to focus on the movement of your weight. This will help you counterbalance your body where its necessary. Essentially, you want to limit the weight of your body from moving too quickly in any one direction. Bringing your attention to your core (specifically your pelvis and lower belly) is usually the most effective way to tune into your weight as it is transitioning. One of the challenges with transitions is that they can undermine the quality of the posture that you’re moving into. I always tell my students that they need to land on the note, not bulldoze their way through it. Each pose in a flow—or each pose within a transition—should have its own individual resonance. So, when you transition into a pose, don’t rush. Take your time and land. Stabilize and maintain the pose that you’re transitioning into. Most transitions are done on the exhalation. Remember, your muscles are usually contracting more strongly between the postures (when moving slowly) than they are in the postures. It’s hard to take a decent inhalation when your body is more tensile. You can, however, take a nice, long exhalation through the course of most transitions. Exhaling during transitions may also help you settle and focus your attention. This is such an important set of transitions because it’s common and accessible—and, even more, it lays the foundations for transitions between all of your standing postures. 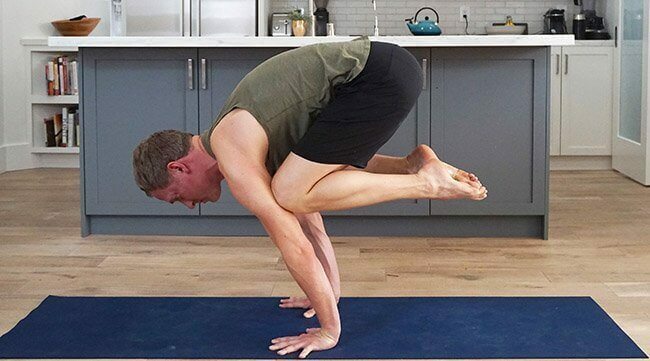 The key instruction for moving into Half Moon Pose is to place your bottom hand on the floor or block and step your back foot much closer to your front foot before taking off moving into Half Moon. Once you do this, simply lean weight forward so it is split between your bottom arm and standing leg. The key to transitioning back to Warrior to is to slow your movement down by continuing to lean the weight of your upper body into your standing leg and arm while you very slowly step your top leg back to the mat. There are a few tips that can make the transition to Handstand more effective. First, practice the transition without trying to get all the way into Handstand. Think about the transition into Handstand as it’s own practice—it’s own set of variables to develop without the stress of trying to make it into the pose. This will free you up to learn the technique of the transition. Second, imagine that your standing leg—the one that you’re jumping up with—is like a pogo stick. You want this leg to feel like it’s pulling straight up when you jump instead of swinging backward. The motion of pulling the leg straight up will help move your pelvis forward instead of flinging it backward. Third, press your fingertips very firmly into the floor. You should grip the mat with your fingers in order to give you a larger base to balance on—and, because your fingertips are instrumental in keeping your balance. Yes, there are many more details involved in transitioning to Handstand, but these will get you moving in the right direction. This transition focuses on transitioning your weight from your feet to your hands. It’s not easy, but it’s simple. Students often make the mistake of trying to lift their feet up in the posture, but the real transition here is forward not up. From a deep squat with your hands on the floor, focus on shifting your weight from your feet forward into your hands. Instead of having your students do Bakasana only once and stay as long as possible, have them practice moving in and out of the pose 5 or 6 times in a row while focusing on the transitions.